My daughter, Amber, is having her first blog giveaway. 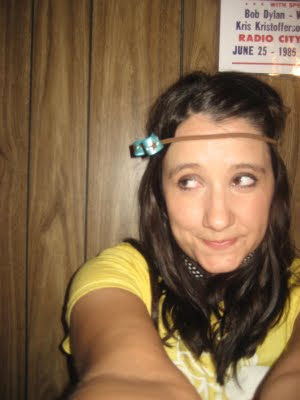 So, rush right on over to Hoot-n-Annie to sign up for her headband giveaway because it ends tonight! This sweet little girl, Jersey, came into our family right before we lost our cat, Callie. She is helping to heal our hearts. Grandma Chickie, Rick's Grandmother, lost her dog a few months ago and wanted us to look for another one for her. We had been visiting Petsmart on the weekends where shelters have pet adoptions. This little dog latched onto me and it's been "love" ever since. She is the huggiest dog I've ever seen. We did get a dog for grandma which I will share in another post. Don't you just love her markings!!! awwww, what a sweet doggie! so cute :-) I miss having a dog (not that I don't love my Pumpkin!) and bless your heart for adopting a dog! 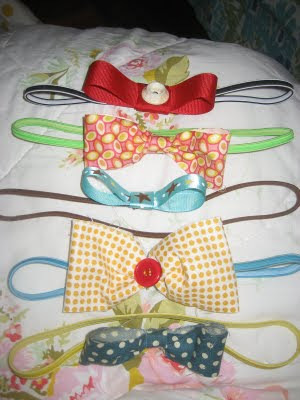 What cute headbands! Your whole family is talented! Have fun this weekend! Oh My Gosh! Jersey is Adorable!!! Oh, the new pup is so sweet! Cathie, good luck to your daughter! I love Jersey (not just because I used to live in NJ)she is so cute and I do love those markings!! Good luck with her! Congratulations on your new someone to love! I hope that all went well with Ambers giveaway! Her bows are very cute. Jersey is 110% pure cuteness! Hi Catherine, Jersey is beautiful...congratulations, I know she will bring you a lot of cheerful and happy times. I am in love w/ Jersey! What a beautiful boy and very nice markings! Congrats on your new baby! And I see your daughter has picked up some artistic talent from her mother! I am headed over to her blog! You're signed up for the giveaway! Love your new doggie. What kind is he? Good for you for adopting a dog from a shelter. To answer your question, Buddy is an Australian cattle dog mix(he love to heard everything from animals to tractors to people) and he has one very blue eye and one half black/half green eye. He's a REAL character! A great big thanks for visiting my blog today and for taking the time to leave a kind comment. I am loving your artwork, new puppy and daughter's bows. What talent. Your daughter is really a pretty young lady. I had a look at her blog and it´s very sweet. How CUTE is Jersey! I think he's adorable, I just love his face so full of personality. Your daughter is wonderful.I bet she got her talents from you.